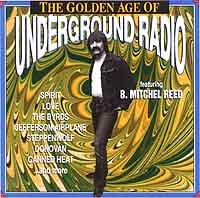 The Golden Age of Underground Radio featuring B. Mitchel Reed is a new CD compiled by Rick Williams of DCC Compact Classics. Airchecks of the "Beamer" on KMET, Los Angeles, 1968 - 1971 were provided by Carole Reed, and this volume faithfully recreates the sound of a typical airshift. It also includes 14 uncut vintage stereo rock originals from SPIRIT, CANNED HEAT, DAVE MASON, THE BYRDS, and others. Through a special arrangement with W3 Public Relations, Los Angeles, and DCC Compact Classics, TEN of these collectors' quality CD's were awarded to Repository visitors who BEAT THE BEAMER between October 26 and November 15, 1997. Brian Kay KPND Sandpoint ID "Morning Mouth"
All of the above were winners! You can play the contest, too, though you won't win anything if you're right. If nothing else, enjoy the "clues" - all but one are authentic airchecks of BMR on KMET, L.A.
B. Mitchel Reed, one of the few to be remembered for his work in AM Top 40 (KFWB, WMCA) and FM Underground (KMET) radio, would have known the answers to the following questions! Can you BEAT THE BEAMER? DCC CD! When Mick Jagger said "I'd rather be dead than sing Satisfaction when I am 45", how old was his daughter? DCC CD! The 1969 Top 40 hit single featuring guitarist Randy California was originally released on what label? Excerpts from "The Golden Age of Underground Radio, Volume 2, Featuring B. Mitchel Reed on KMET 1968-1971" used with the written permission of DCC Compact Classics, 9301 Jordan Avenue Suite 105, Chatsworth, CA 91311. ©1997-2000 by Richard W. Irwin & REELRADIO, INC.